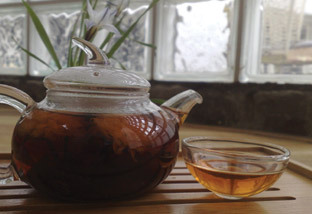 Tummy-Soothing Pu Erh – Emperor Pu-Erh 1998 Vintage steeped with dried chrysanthemum flowers. In this last part of the “Nourishing Oriental Herbal Infusions” series, I am looking at the use of Chinese tea as medicine. The earliest record of this is in the Shennong Bencao Jing (The Divine Farmer’s Herb-Root Classic) compiled towards the end of the Western Han Dynasty (206BC). Shennong, a mythical character, is credited with identifying hundreds of medicinal and/or poisonous herbs by personally testing their properties. This was crucial to the development of Traditional Chinese medicine. Shennong had a crystal stomach. He could see the effects of different plants and herbs on himself. After “acquiring” 72 toxins from tasting various plants, he was (not surprisingly) feeling pretty unwell. But then he accidentally tasted tea from the leaves on burning tea twigs, carried up from the fire by the hot air, and landed in his cauldron of boiling water. According to legend this accidental detox cured him immediately! It is impossible to do a detailed list of all the benefits of tea in one blog. There are myriad research studies on the various categories of tea. My personal experience tells me, just have an open mind and let your body tell you whether a particular brew is good for you! Unoxidised green tea is considered slightly Yin in nature, therefore suitable for drinking (a) during spring and summer months and (b) for people with a Yang body constitution. Good quality green tea is high in umami sweetness and packed with vitamins C and E and beta-carotene. Its unoxidised nature means that more of the catechins have been preserved. These are good for strengthening the immune system and can help to prevent aging. Oolongs are full of minerals and vitamins. They’re slightly alkaline and therefore excellent for most people’s predominantly acidic diet. They’re also claimed to strengthen our blood vessels (preventing their hardening). Pu Erhs are post-fermented teas. Lots of research has been done on Pu Erhs. They are considered to be very good at reducing the “Three Highs” (high blood pressure, high blood sugar and high blood cholesterol), reducing the intake of fat and helping the body to get rid of toxins. However, one has to be careful in the choice of Pu Erhs. Raw (‘Sheng’) Pu Erhs less than 3 years old are deemed to be rather Yin in nature and can be slightly unpleasant to drink. Those vintaged for more than 3 years will have mellowed. Ripened (‘Shou’) Pu Erh are Yang. In choosing what to put in your body your particular Yin/Yang constitution should be a consideration. The black teas we are all familiar with are not without medicinal benefits. The tannin is good for reducing blood cholesterol and has anti-bacterial properties. Good quality black tea can also help to relax and calm the body and mind. It is common for various herbs and grains to be added to the teas to achieve specific medicinal effects. Here are some recipes. – Awaken the tea by pouring on hot water then quickly (in 10 seconds) strain and discard the liquor. – Add chrysanthemum flowers to the Pu Erh tea leaves and add hot water. Infuse for 1 minute. Strain and enjoy. – Continue to add hot water for multiple infusions throughout the day. – Add dates and longan fruit to the Pu Erh tea leaves and add the water. Infuse for 1 minute. Strain and enjoy. – Infuse the tea in the hot water for 1-2 minutes. – Stir in the vinegar and enjoy it hot! – Clean the bitter gourd and remove the seeds. Thinly slice the bitter gourd and lightly dry the slices in a very low oven for 20 minutes. Mix with green tea leaves while still warm. Leave to cool and store in airtight container. – Brew this home-made cooling tea by adding 1 part to 10 part hot water and infusing for 1-2 minutes. – Add the water and apricot pieces into a pot and bring to a boil. – Remove from the heat and add the black tea leaves and infuse for 2 minutes. – Strain and enjoy the tea and the softened apricot pieces. – Brew the black tea with the hot water. Strain and chill. – Add agave syrup to taste when chilled. – Add 1 part black tea brew to 1 part beer. Serve on the rocks. – Dry fry the black sesame seeds till fragrant. Grind the sesame seeds. 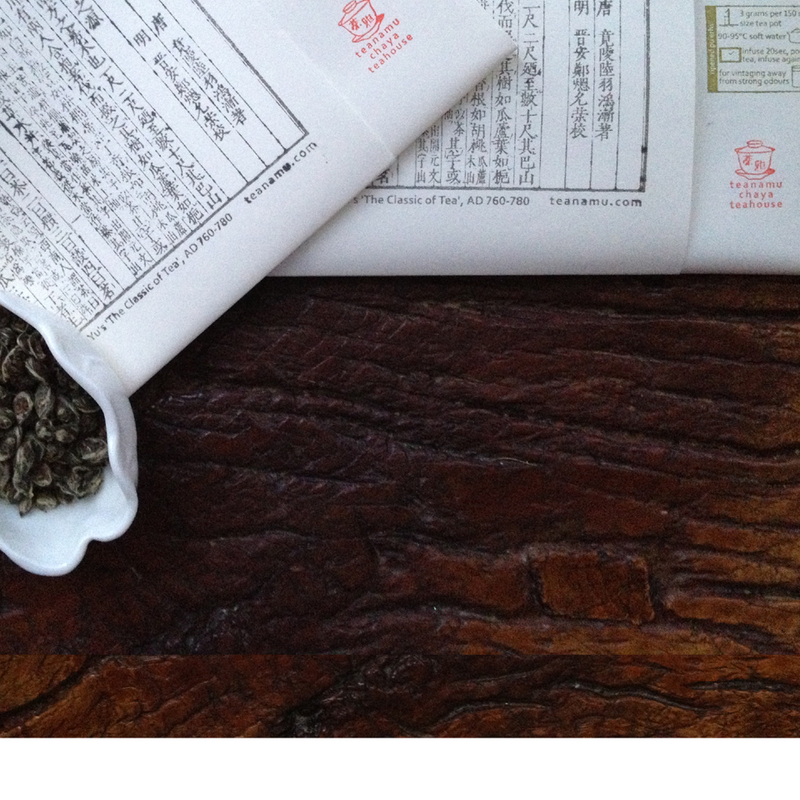 – Add the ground sesame seeds to the dark oolong tea leaves. Infuse with the hot water for 1 minute and strain. – Add water for multiple infusions. – Add the tea brew and rice to a pot and bring to a boil. Then lower heat to a simmer. Stir and add more water to achieved desired consistency. – Add sugar and serve hot. – Collect all the brewed green tea leaves after drying them in a very low oven or under the sun. – Put them into a muslin cloth packet. – Add to your hot bath, enjoy the fragrance of the green tea and absorb the green tea from the outside in! – Infuse the tea and osmanthus flowers in the hot water for 1-2 minutes. – Strain and add rock sugar to taste. – Continue to add hot water for multiple infusions.